It is with an overwhelming desire to thank you for the miracle you've brought into my life and an untold number of others by treating our Guru Srila Narayan Maharaja. 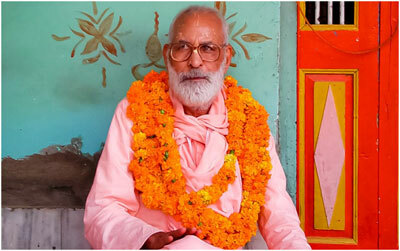 He is a renowned Guru who lectures throughout the world, writing hundreds of books to teach promote and broadcast the precepts of Pure Bhakti. His Divine Grace Srila Bhaktivedanta Narayana Gosvami Maharaja is the most prominent world teacher of Bhakti Yoga, divine spiritual love. His main mission in life was to share his knowledge. When He started to realize He was developing Alzheimer’s He told us that if he could no longer write and teach, he did not want to stay on this physical plane much longer, and would rather return to the eternal pastimes of our Lord. We all were greatly upset, that we would lose the association of such a saint, and we decided we would do anything in our power to keep him here. That is when we found you. After your treatment, we were surprised and joyful by the clarity of mind He had. He is writing non-stop, and it seems like His pen never leaves the paper; only to stop to give lectures. He has written 17 books so far and continues to tour around the world for the last many years since your treatment.